German doctors say an Afghan man who for years suffered from headaches, a runny nose and eyesight problems was found to have a 10-centimetre (four-inch) pencil lodged in his head. 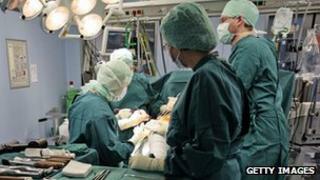 Surgeons at Aachen University Hospital removed the pencil and the 24-year-old is reported to be recovering. The pencil had injured the man's sinuses and right eye socket. When asked how the pencil had got there he recalled that as a boy he had once fallen and had a serious nosebleed. The case was presented at a medical conference in Essen on Tuesday by Prof Frank Hoelzle of Aachen University. The pencil was found only after a detailed medical examination using computer tomography - an image scanning technique, German media report.